Nowadays, Instagram is proving to be the must-have social media platform for businesses, brands, and influencers alike! It's the go-to platform for game-changers in most sectors, and is quickly proving to be a great tool for improving your Personal Brand and get recognition - Fast because we all recognize the value that Instagram provides, particularly to bloggers who want to be influencers in their blogging niche. Now, I'm guessing you're reading this because you're also hoping (or planning) to get your Instagram Branding down to a "T" and reap the associated benefits because your blogging biz needs it, amiright?! Most importantly, Brands start to recognize you as an influencer and may be propelled to want to collaborate with you on Brand Sponsorships. And all of that is fantastic news and more reason for you to brand your Instagram and improve your Personal Brand. 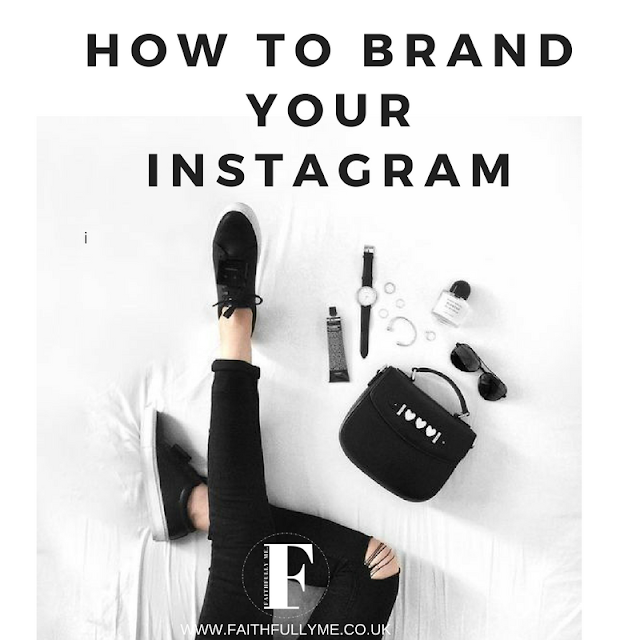 So if that's what you want, read the 4 tips below on how to brand your Instagram. 1/4 DECIDE ON YOUR BRAND STORY. By Brand Story I mean, that underlying narrative that you'd like your Instagram to portray to your followers. So decide what message about yourself or your brand do you Want to portray on your Instagram. Do you want to be seen as a keen traveler? A style maven? An influencer within the blogosphere? A fashion maven? Or an amazing foodie? Whatever it is, decide upon it first and foremost as that is one of the criteria that inform your Instagram's branding because creating a memorable brand is all about the message and rhetoric behind someone and that's exactly what amazing Instagrammers seem to know. You obviously joined Instagram to socialize with and reach a certain type of individual(s) be it to further your business or personal goals. So identify your tribe and the ideal people that you'd like to reach through your Instagram. What value do you provide? Yeah that's right! Instagram is no longer about posting selfies non-stop without any clear message behind them other than: "look at me, I'm pretty!" So, what do you want people to visit your Instagram for? What value will you be providing through it? Will it be insightful tips? For example, if you look at our Instagram Profile, there's always a post that provides value in one way or another. Like this Post where we shared blogging tips on the 5 Ways To Excel at being a newbie blogger. or this post where we shared #Tips on How To Get A Job Without Any Related Previous Work Experience. We shared these on Our Instagram and linked the full blog post in our bio as a way to give anyone who didn't see our post another chance to read it, but most importantly, our aim was to provide value to our readers. When it comes to cultivating an amazing online brand, aesthetics matter big time! The best way to brand your Instagram is to pick a look that defines you as a brand and one that will prove to be appealing to your ideal tribe. For example, if you look at Our Instagram, we've picked a Monochrome color pallet with hints of green here and there! Reason being black and white is that colour combination that is classic, timeless, and identifies with power, completeness, and authoritativeness because our aim for our Instagram is to position ourselves as thought-leaders amongst millennials. So, when it comes to picking an aesthetic for your Instagram Branding, this will originally be guided by 1) the message you want to send out to your followers; and 2) who your intended demographic is. Let's say you want to attract foodies, then your Instagram feed could have a colourful and eclectic aesthetic., or if its blogging biz ladies, then perhaps your Instagram Brand Aesthetic could be light, bright, using hints of soft pinks where possible. Do you see where I'm going with picking an aesthetic? So there you have it, put these Instagram Branding tips into place, and you'll be well on your way to improving your own Personal Brand, as well as having an amazing Instagram Profile that's going to position you as an influencer and help you gain your ideal tribe. P.S. Don't Forget To Follow Us On Instagram. Haha :) I know @Marette, I think Instagram has totally changed as of late. Yes it's fine to post a random selfie here and there, but there should be a clear brand message behind it or else it's just seen as a bit narcissistic, you know?! Because people either want to be informed, or entertained, and that's where having a clear brand message for your Instagram can really come into play,you know?! Instagram is a whole new thing for me. I really enjoy posting photos but i can never understand how some people have such amazing followers. I"ve been focusing on IG lately and seeing what works and what doesn't. Thanks for the tips! Yep, absolutely agree! Instagram is a definite must have and being bloggers its where most brands find us. I have the hardest time choosing an aesthetic and sticking with it, ugh!